Solo Express Sukhumvit 81 is the expression of Bangkok’s Budget Luxury, situated in a quiet street of Sukhumvit 81 which sits just off Bangkok’s busy street. Just a 30 minutes distance from the airport. Solo’s best attributes are the convenience it provides to escape the draining traffic of Bangkok by enabling you easily access key public transport systems which can be reached by the hotels Free Shuttle "Tuk Tuk" Service. 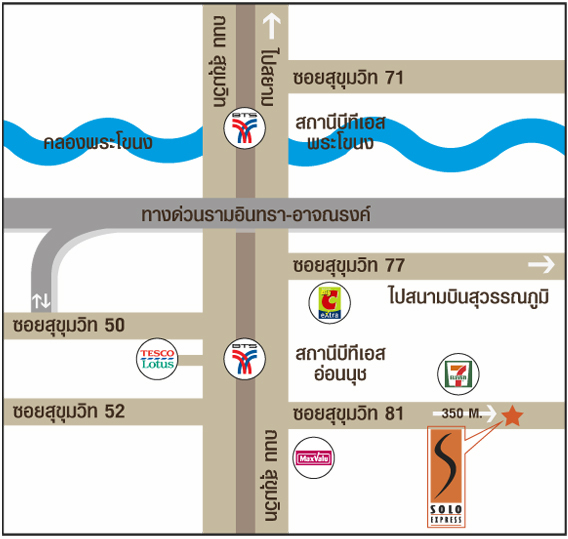 Whether you are travelling by road, sky train or MRT it is just minutes away from On Nut train station. Convenient road access to the expressway system also allows you to reach to Don Mueng, Suvarnabhumi Airport and other provinces easily. For leisure pursuits the expressway provides scenic drives to top seaside destinations such as Hua Hin and Pattaya.